Riding horses for as long as she can remember, Trina deLisser, director Half Moon Equestrian Centre, has had a lifelong affair with horses. She recalls spending glorious afternoons after school riding the hills just outside of Kingston Jamaica with her father, who was a polo player. Because of my long-standing affinity with horses, it was only natural for me to be in the industry. I started the Equestrian Centre over 30 years ago, on 14 August 1986 to be exact. ?We started with merely 6 horses and eventually grew to a stable of 17 horses. Five years later, Half Moon built the hotel premises and developed a fabulous stable which now boasts 28 beautiful horses and our family includes 4 delightful ponies, 2 donkeys, 6 dogs, 2 cats, 6 birds and 3 rabbits, all waiting to welcome our guests. The Halfmoon Equestrian Centre has something to offer everyone. We have pony rides and an experience in the pony park for the little ones. Rookies Round Up is a beginner horse ride for anyone above 6 years old and never ridden before. Start with a short lesson in the arena with a basic level of instruction, then a jaunt through the property. Sand Stroll, also for beginners, further includes a scenic walk to the beach and walking along the shallow waters with your horse. Turf and Surf, a favorite with guests who have riding and swimming experience, starts in the arena where riders can trot or canter. 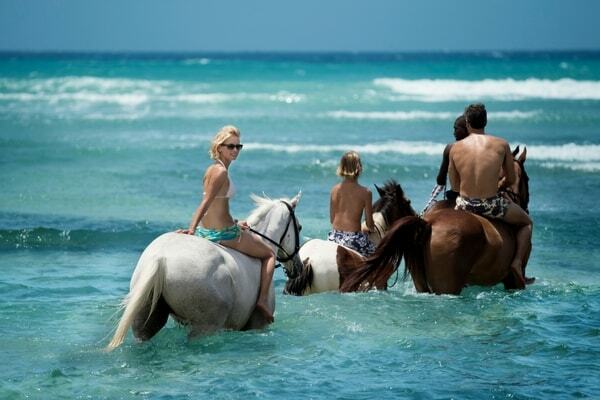 We then move down to the beach where the horses swim with guests on their bare backs. Positive Empowerment is an unmounted session with a horse in the round pen. Using body language alone to first control the horse and it gain its trust. This is a great way to build confidence and learn to build a deeper connection with horses. All riders must wear helmets, which we provide, and be properly dressed, with the correct footwear?. If you are entering the water with the horses, life jackets are provided and must be worn. All instructors have been trained to ensure each and every rider is comfortable and know what they are doing while on their horses. All our rides are semi-private (one guide escorts two persons) to ensure personal attention?. Our guests’ comfort, safety, and experience are Half Moon Equestrian Centre’s absolute priority. At the Equestrian Centre, we love to introduce everyone to our world of animals and have created an environment where we can welcome just about anyone and everyone. We encourage persons of all ages and special needs to visit with us even to just interact with our animals and hear stories about rescues and successes in rehoming injured, abandoned horses, dogs, and cats. Horses have great healing abilities and we often hear back from our guests that they find solace here. To learn more, please visit www.horsebackridingjamaica.com.